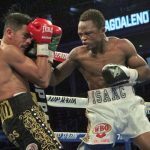 Dogboe went down in the first, but battled back well. 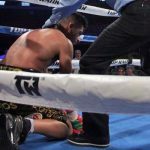 Magdaleno was knocked down once in the 5th and twice in round 11. 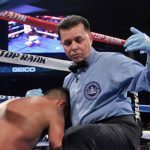 After the second knockdown, referee Benjy Esteves Jr stopped the fight without a count. The time was 1:38. 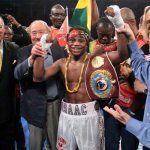 I had Dogboe leading on my card going into the 11th. 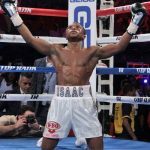 In a WBA middleweight final eliminator, former champ Daniel Jacobs (34-2, 29 KOs) scored a hard fought unanimous decision over previously unbeaten Maciej Sulecki (26-1, 10 KOs) on Saturday night at Barclays Center, Brooklyn, New York. 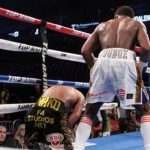 Jacobs dropped Sulecki in round twelve to punctuate a 116-111, 117-110, 115–112 win. Unbeaten 304lb Jarrell Miller (21-0-1, 18 KOs) pounded Johann Duhaupas (37-5, 24 KOs) for 12 rounds in a WBA world heavyweight title eliminator. Miller bounced shots off the rugged Duhaupas all night, but the Frenchman absorbed everything “Big Baby” had to offer. Scores were 119-109, 119-109, 117-111. 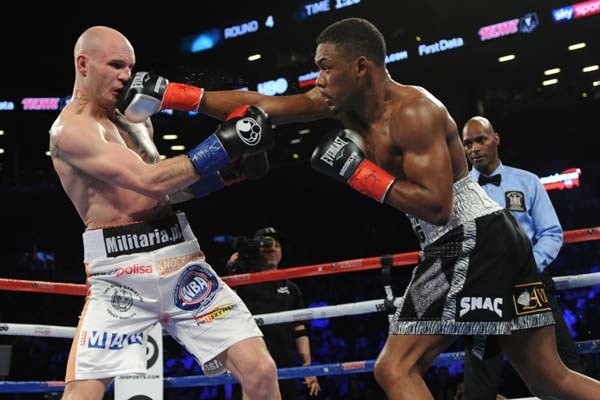 Next up could be Miller against WBA, IBF, WBO heavyweight champion Anthony Joshua. In a WBA/IBF female lightweight title unification, WBA champ Katie Taylor (9-0, 4 KOs) scored a ten round unanimous decision to seize the IBF crown from Victoria Bustos (18-5, 0 KOs). Scores were 99-91, 99-91, 98-92. 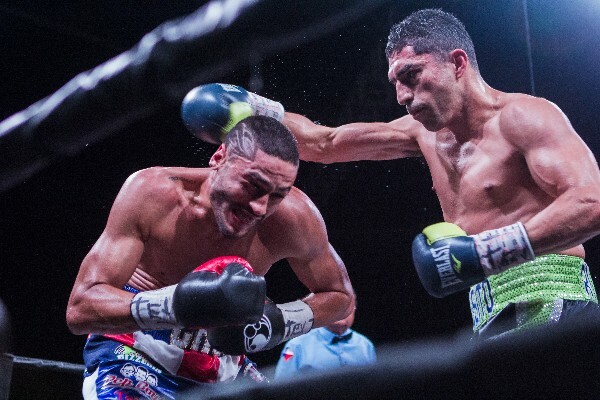 Junior welterweight Josesito Lopez (36-7, 19 KOs) scored a hard fought ten round unanimous decision over previously unbeaten Miguel Cruz (17-1, 11 KOs) on Saturday night at the Don Haskins Convention Center in El Paso, Texas. “The Riverside Rocky” pressed the action and won going away 99-89, 99-89, 98-90. Cruz was deducted two points for low blows. 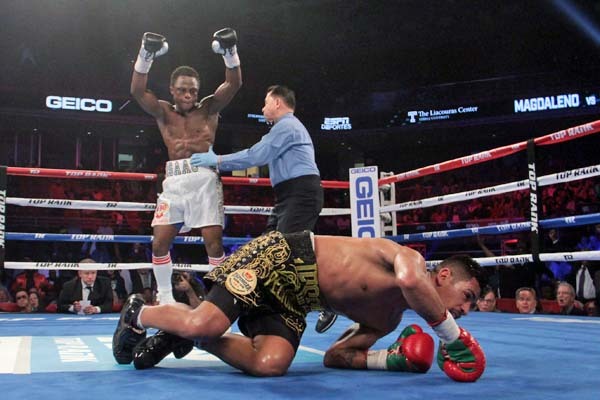 Former WBC super middleweight champion Anthony Dirrell (32-1, 24 KOs) dropped Abie Han (26-4, 16 KOs) in round one, but had to go the full ten in a 100-89, 99-90, 99-90 unanimous decision.Former WBA interim featherweight champion Claudio Marrero (23-2, 17 KOs) needed just 33 seconds to knock out previously unbeaten Jorge Lara (29-1-2, 21 KOs). A flush straight left hand left Lara flailing around on the canvas. 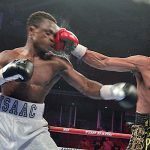 North Philly super middleweight Jesse Hart, 24-1, 20 KOs, scored a seventh round TKO over Demond Nicholson of Laurel, MD, 18-3-1, 17 KOs, on Saturday night at the Liacouras Center in Philadelphia, PA. Nicholson hurt Hart with a right in the first, but Hart dominated most of the action on this night. 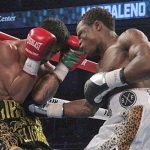 Hart dropped Nicholson twice in round three and then finished the fight in round seven of the scheduled 10-rounder. In the seventh, Hart wobbled Nicholson, and Demon squatted down, touching both gloves on the mat. 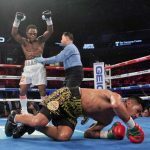 Referee Shawn Clark did not call it a knockdown. Nicholson got up and when the fight resumed, Hart swarmed him, drove him across the ring, and put him down again. Nicholson refused to get up and Clark waved the fight to an end at 2:26 of the seventh. 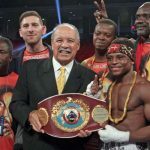 The win earned Hart the vacant NABF super middleweight title. North Philly’s Bryant Jennings, 23-2, 13 KOs, defeated Tacony’s Joey Dawejko, 19-5-4, 11 KOs, by 10-round unanimous decision to win the vacant PA State heavyweight title. The first half of the all-Philly fight was fairly close. However, Jennings pulled away in the second half to nail down the victory. Both fighters landed many good shots, but Jennings was the clear winner. 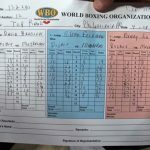 All three judges scored the bout 98-92 for Bryant. My tally was a point closer, 97-93. 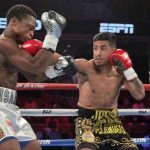 The awaited, vacant European (EBU) welterweight bout between unbeaten Kerman Lejarraga (25-0, 20 KOs) and an experienced boxer like Bradley Skeete (27-2, 12 KOs) lasted less than five minutes as the local banger won by second-round technical knockout at Bilbao Arena. The main event topped a MGZ Promoions card in northern Spain, where all the three local fighters involved in championship fights came out victorious. Former middleweight and super middleweight world champion Arthur Abraham (47-6, 30 KOs) scored a twelve round split decision over Patrick Nielsen (29-3, 14 KOs) on Saturday night at the Baden-Arena in Offenburg, Germany. Operating behind his famous double guard, the 38-year-old Abraham stalked Nielsen and landed the harder shots. Nielsen had the higher workrate. Abraham was credited with a knockdown in round ten after Nielsen went to the canvas following some rough-housing in a corner. 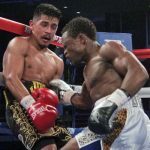 Scores were 114-113 for Nielsen, 116-111, 116-111 for Abraham. WBSS super middleweight semi-final substitute Nieky Holzken (14-1, 11 KOs), who took Callum Smith twelve rounds in February as a late sub, returned with a third round TKO over journeyman Bernard Donfack (23-19-4, 11 KOs). Holzken dropped Donfack in round three and Donfack’s corner soon after threw in the towel. 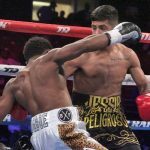 Unbeaten light heavyweight prospect Leon Bunn (9-0, 6 KOs) added the name of Tomas Adamek to his resume, although this was Czech journeyman Tomas Adamek (26-16-2, 9 KOs), not the former two-division world champion. 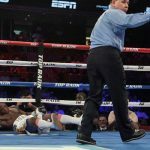 Bunn won by eight round unanimous decision, no scores announced. 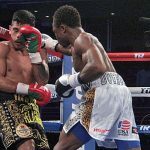 The IBF has reportedly granted the exception requested by unified middleweight world champion Gennady Golovkin to defend his title against late sub Vanes Martirosyan. 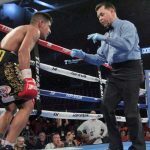 The ruling requires GGG to face mandatory challenger Sergey Derevyanchenko in his next fight, which could KO a GGG vs. Canelo rematch in September if Golovkin wants to keep the belt. 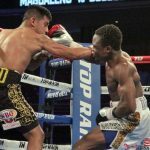 First round action got underway Friday night in the Jose Sulaiman/WBC World Invitational Welterweight Tournament at the KFC Yum! Center in Louisville, Kentucky. Quarterfinal 4: In an upset, alternate fighter Francisco “Chia” Santana (25-6-1, 12 KOs) surprised 2008 Olympic gold medalist and world title challenger Felix Diaz (19-3, 9 KOs), the #1 seed, taking a ten round majority decision. Santana brought the pressure for most the fight. Diaz spent a lot of time on the ropes. Scores were 95-95, 96-94, 98-92, 98-92, 98-92. Quarterfinal 3: Chris van Heerden (26-2-1, 12 KOs) outworked Timo Schwarzkopf (18-2, 10 KOs) to win a ten round unanimous decision by scores of 98-92 3x 97-93 2x. Quarterfinal 2:Fredrick Lawson (27-1, 21 KOs) outpointed Baishanbo Nasiyiwula (13-2-1, 6 KOs) over ten tactical rounds. Scores were 99-91, 96-94, 98-92, 97-93, 97-93. Quarterfinal 1: Brad Solomon (28-1, 9 KOs) scored a ten round split decision over Paddy Gallagher (13-4, 8 KOs). Gallagher dropped Brad Solomon at the end of round one and pulled out to an early lead. Solomon rallied after open scoring revealed he was down on three of five cards with one even. In the end, scores were 97-93, 97-94 95-94, 95-94 Solomon, 96-93 Gallagher.